Mystart3.dealwifi.com is a browser hijacker that belongs to a potentially unwanted program called Deal Wifi. 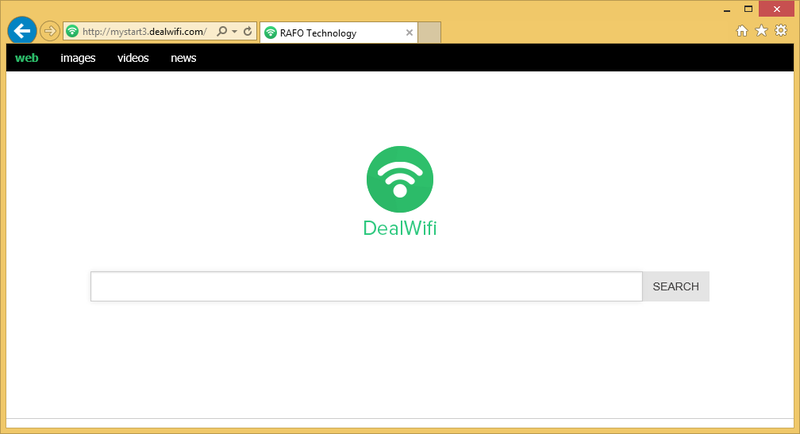 This application was developed by RAFO Technology, Inc. Its description is provided on Dealwifi.com and it states that the software can turn your computer into a Wi-Fi access point. Through your sharing anyone nearby will be able to surf the Internet. Unfortunately, the page does not mention anything about the app changing your browser settings, which is exactly what it does upon arrival. The hijacker affects all of your browsers. It not only alters your preferences, but also floods you with ads, tracks your cookies, slows down your Internet connection, and causes other disruptions. We recommend that you delete Mystart3.dealwifi.com along with its related program without hesitation. Although Deal Wifi can be downloaded from its official website, it usually enters computers through free software bundles. Potentially unwanted applications use the bundling distribution method, because it allows them to get installed unnoticed by the users. It is possible to prevent that by choosing the Advanced installation mode and deselecting the additional offers presented to you. We advise that you do that the next time you download free third party software from such websites as soft32.com, filewin.com, cnet.com, and similar. Once inside, the hijacker alters your browser settings including your home page and default search provider. These settings are replaced with Mystart3.dealwifi.com. The site contains a search box with such parameters as Web, Images, Videos, and News. It shows you original results, however, they include multiple sponsored links. In addition to this advertising content, you will see various commercials while visiting other webpages as well. In fact, you will see pop-ups, coupons, banners, and other ads no matter where you go online. The problem with the adverts is that not all of them are safe. You could be exposed to unreliable ads that could lead you to malicious pages. If you do not want to take any unnecessary risks when it comes to your online security, you should terminate Mystart3.dealwifi.com as soon as you can. There are plenty of reasons for you to get rid of Mystart3.dealwifi.com. You can do that manually or automatically. Automatic Mystart3.dealwifi.com removal option is much more reliable, because it allows you to clean your PC completely. If you download the anti-malware application from our page, it will scan your system and erase Mystart3.dealwifi.com along with other potential threats. The security tool also comes with real-time online protection and other beneficial features, so it will stay useful in the future. Alternative solution is to eliminate Mystart3.dealwifi.com from your browsers manually. This removal option requires you to uninstall the hijacker’s related program, i.e. Deal Wifi, and to restore your web browser settings. Instructions presented below can help you with these tasks.